This recipe adds a little punch to the classic basil pesto. It also tastes great as a substitute for tomato sauce on a pizza. Wash and pat dry the basil and parsley. Drain the sun-dried tomatoes (rinse and drain if you're using the oil-packed kind). 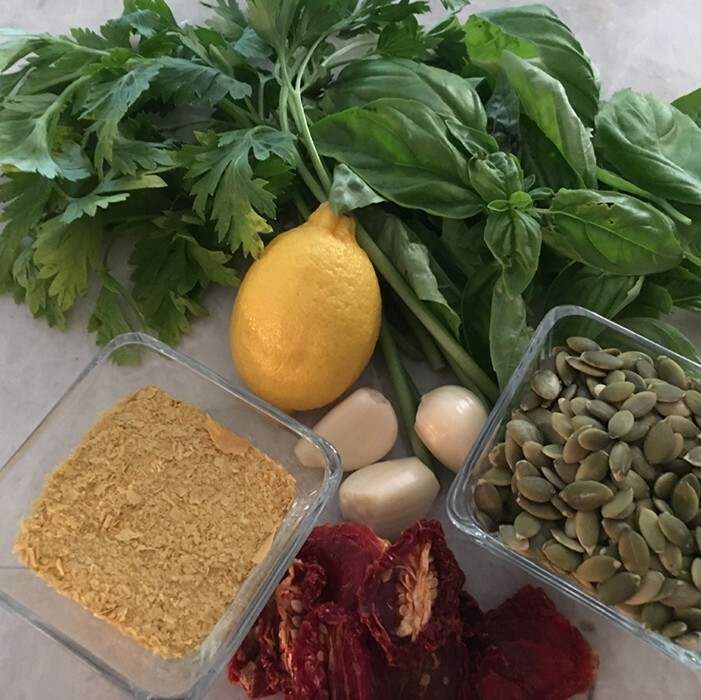 Add pumpkin seeds, sun-dried tomatoes, basil and parsley to food processor; pulse until coarsely chopped. Add garlic, lemon juice, nutritional yeast and continue to pulse, drizzling in olive oil. You're done - it's that easy! Dicing up the classic pesto is so fun, and gives it that little twist that makes if feel new! You can add the nut of your choice, or take out the parsley add some spinach instead (just remember to keep the stems, as they're packed with nutrients). If you like it spicy, then seed, chop and add to the food processor the hot pepper of your choice. Switching up your pestos with a variety of nuts, seeds, greens and peppers not only gives you a range of different nutrients, it also keeps your plates looking different so your kids (and you) won't ever get tired of this incredibly healthy staple.